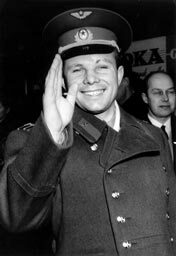 Tomorrow—April 12, 2011—marks the 50th anniversary of Yuri Alekseyevich Gagarin’s first spaceflight, the first time a human being orbited Earth. In a flight that lasted just 108 minutes, Russian cosmonaut Gagarin traveled in the (very uncomfortable-looking!) space capsule Vostok 1. In recent years, his achievement has been marked worldwide by a festival known as Yuri’s Night, and many events tomorrow will honor him—and all who have followed him into space. Yuri Alekseyevich Gagarin, we salute you!